Rugby's greatest rivalry resumed last weekend when South Africa defeated New Zealand in their Tri-Nations clash in Bloemfontein. "When South Africa plays New Zealand, consider your country at war," said legendary 1930s Springbok Boy Louw when he spoke to his countrymen ahead of a Test against New Zealand in 1949 - such is the intensity of their long-running battle for the supremacy. From their first official meeting at Carisbrook in 1921 - where the All Blacks triumphed 13-5 - to their clash in Cape Town last year - won 19-0 by the visitors - the two sides rarely fail to put on a show. To celebrate the 77th meeting of the two sides (New Zealand lead South Africa 42-31 in the all-time stats) we reflect on some of their more memorable meetings with our latest Scrum Seven. The two sides have met just once in the final of the sport's showpiece event and that came at the 1995 Rugby World Cup in South Africa. 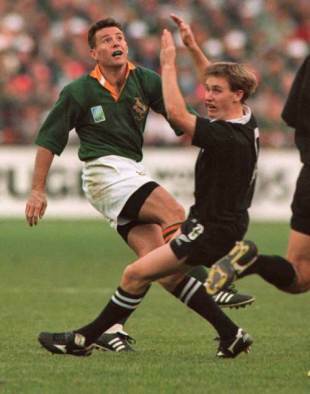 The Springboks, appearing in their first World Cup due to their sporting isolation during the apartheid years, trumped the All Blacks 15-12 in extra-time thanks to a drop goal from the boot of Joel Stransky. The victory, over-shadowed by accusations that the New Zealand players were victims of food poisoning on the eve of the game, took on even greater significance than any previous victory over their fierce rivals - uniting a nation just a year after South Africa's first democratic elections. The match also produced the iconic image of Springboks skipper Francois Pienaar receiving the Webb Ellis Cup from South African president Nelson Mandela who himself was decked out in a replica of Pienaar's jersey. Controversy greeted the Springboks at every turn during their 1981 tour of New Zealand due to the continuing apartheid policies of the South African government. The decision to proceed with the tour in the face of intense pressure sparked anger throughout the country. The tourists' second game against Waikato had to be abandoned when several hundred protesters invaded the pitch and the Test series was also marred by protests. The final Test in Auckland was disrupted by flour-bombs dropped on to the pitch from an airplane and the home side's victory, and series win, were subsequently over-shadowed. The All Blacks had to wait until 1996 for their first series triumph on South African soil with captain Sean Fitzpatrick steering the All Blacks to their historic success. A 29-18 victory in their first Test clash in Cape Town and a 23-19 win in Durban had put the visitors on the brink with two Tests still to play. Two tries from winger Jeff Wilson and another from No.8 Zinzan Brooke, who also kicked a drop goal, put the All Blacks on course for victory. Following his side's historic triumph, Fitzpatrick paid tribute to the hosts saying, "You never actually beat the Springboks, you just score more points than them." The Springboks made history with hard-fought victory over their rivals in their 2008 Tri-Nations clash in Dunedin thanks largely to a moment of brilliance from scrum-half Ricky Januarie. With time running out and with stand-in skipper Victor Matfield in the sin-bin, Januarie chipped over the All Blacks' defence and raced after the ball. The bounce went in his favour and he had a clear run-in to the posts. Francois Steyn added the conversion and with the final whistle the Springboks had their first victory on New Zealand soil for 10 years and their first ever at the infamous "House of Pain". The All Blacks' biggest victory over the Springboks did not come on home soil but in the thin air of the high veldt in Pretoria. The rampant tourists ran in a total of seven tries with wingers Doug Howlett and Joe Rokocoko both notching braces and fly-half Carlos Spencer weighing in with a personal tally of 16 points. New Zealand refused to get carried away with coach John Mitchell commenting, "We have got Australia next week and in this professional game your reputation only really survives one week." The All Blacks would once again enter that year's Rugby World Cup as favourites but came up short having obviously peaked too early. Less than a year after their mauling at Loftus, the Springboks bounced back with their biggest post-war win - and second biggest ever - in Johannesburg. Centre Marius Joubert led the way with a hat-trick of tries with Jean de Villiers and Breyton Paulse also getting in on the act. Percy Montgomery weighed in with 15 points with the boot and if he hadn't missed another 13 this would have been New Zealand's heaviest ever defeat. The Springboks followed up the victory with another over Australia a week later to secure only their second Tri-Nations crown and complete a remarkable turnaround from the dark days of Kamp Staaldraad and the Rugby World Cup disappointment of 2003. In a breath-taking encounter featuring an incredible 10 tries - with eight coming before the break, South Africa silenced their critics with a superb all round display. The hosts ran the All Blacks ragged before withstanding a late onslaught thanks to some superb defensive work. New Zealand fought back from a 20-point deficit to take a 37-36 lead midway through the second half courtesy of an Andrew Mehrtens penalty. Springboks fly-half Braam van Straaten re-instated the home side's lead with a penalty before a drop-goal by Mehrtens edged the All Blacks ahead once more. But back came the hosts with scrum-half Werner Swanepoel swooping for his second score and some brave defence in the face of wave after wave of attack saw his side hang on for a remarkable win.